We were back in San Diego for good and my daughter was on summer vacation. It was time to hike, regardless of how hot it was. We filled up our hydration bladders with ice and water and headed out to Ramona, for a rolling hike through some grasslands. 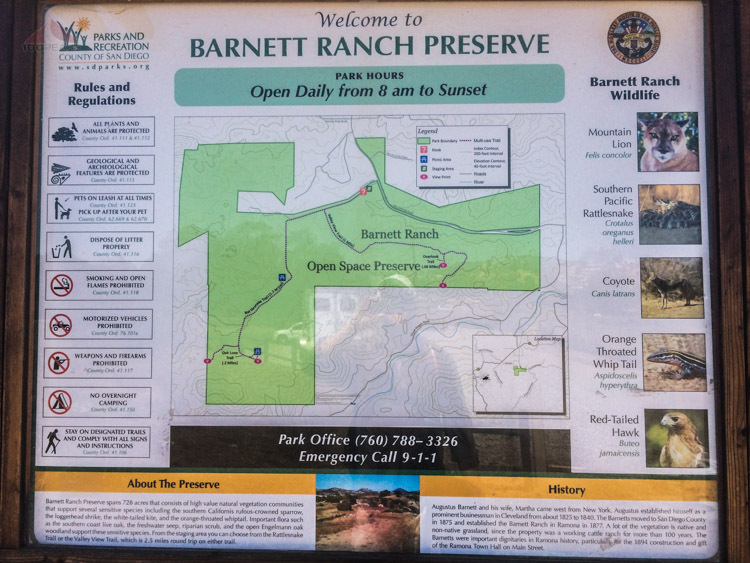 I had driven by Barnett Ranch Preserve several times, but had never stopped to visit. I knew it wasn't going to challenging or have sweeping views of the area, but we wanted to get some trail time in and not drive too far to it. And trail time with my daughter means bonding time. We got to the trailhead and saw some women loading horses into their trailer. The horses looked ready to be in the shade again. We chatted briefly and they wished us a good hike. We quickly read the sign and headed up the road. I told her there was a picnic bench at our destination at the end of the Oak Loop Trail, so she brought some toys to play with during our lunch break. We hiked for a while and then headed east when we thought we were at the right spot, the Rattlesnake Trail, which would lead to the Oak Loop Trail. We hiked for a while before I pulled out my phone and realized we were on the Valley View Trail. 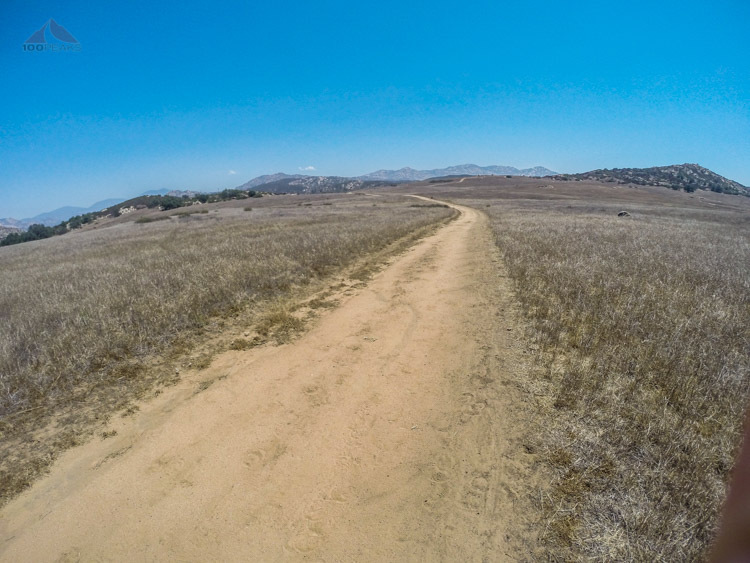 Because I reviewed Google Earth before we left, I knew there was a trail that turned south and met up with the Oak Loop Trail, so we were good. I had wanted to check out the first picnic bench along the Rattlesnake Trail, but we would have to check it out on the way back. We made it to the bench, and luckily it was fairly shady. We sat there for a while, eating lunch and playing with her toys. She seemed so happy to be there. An occasional breeze blew as we looked out over the little valley. It was nice. The sun started edging onto our bench, so we decided to pack our backs and head out. I bushwhacked a little bit to remove a very blue bag from a bush. It was a very old doggie bag with nothing in it. It had long opened up and lost its contents. I carried it out in a grocery bag that I had found on a different part of the trail. We got to the second (or first, depending on where you're coming from) picnic bench and we both wish we would have stopped at this one. It was in complete shade and was not mesh like the one on which we had lunch. It was solid and would have been better for her toys and quite a bit cooler. Now we know. We saw a large mountain lion track, which was likely about a week old, since we had some monsoon rains the previous weekend. When we got to the trailhead, we noticed there was a doggie bag dispenser, with the identical blue bags available. Someone had taken the time to take a bag, pick up their dog's doings, and then huck it into the bushes, where it would be easily seen by everyone. Sophia asked me why anyone would do that, and, once again, when it came to some types of human behavior, I just had to shake my head and tell her that many times people just make bad decisions. All in all, however, it was a nice time to spend with each other. It was warm, but now and again, a breeze came up, reminding us why we take time out of our busy lives and get outside.